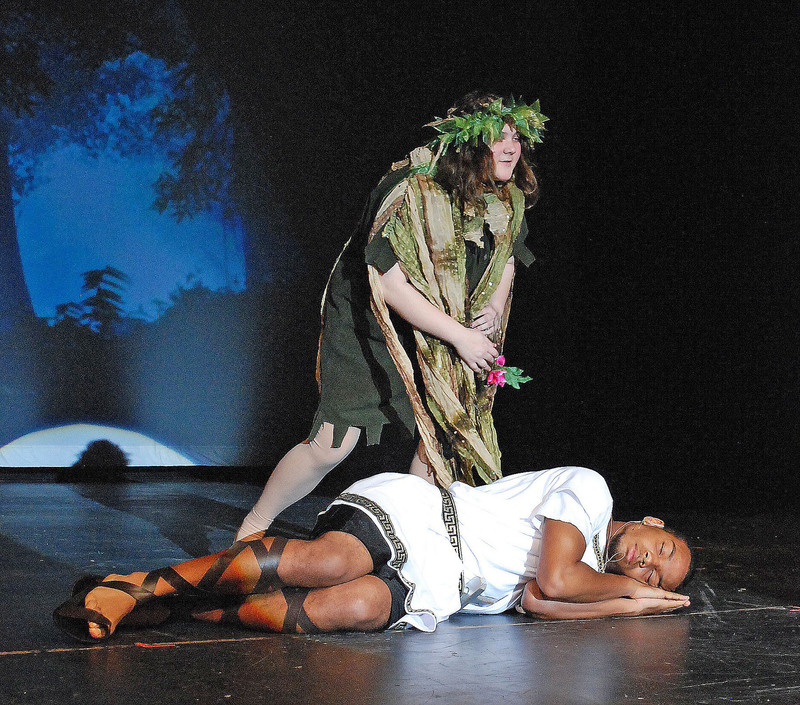 Ancient Rome, a Greek forest, the moors of Scotland and the seaport of Venice all came to life in the Rockland High auditorium on Dec. 6 and 7. Staff and students of RHS hosted a Shakespeare Festival to celebrate the literary genius of William Shakespeare by bringing to life six scenes from the Bard’s plays. Shakespeare’s literature holds substantial value at RHS, especially to the teachers in the English Department. Festival Coordinator, Amy Woodward, even teaches a full year class dedicated to the works of Shakespeare. “I do think the Festival has enormous educational value. Shakespeare wrote plays for a live audience. There is a value in reading his plays, and in watching film adaptations, but nothing beats the experience of Shakespeare presented live,” Woodward said. She added that those in the audience are given the ability to see the range and relevance of these works in a way that just studying them in a classroom may not achieve. “Everyone deserves a chance to understand why Shakespeare is the world’s most famous and universally admired author,” she said. Woodward has been involved in the Shakespeare Festival for many years and this is the second one she has been in charge of. Woodward’s responsibilities involve securing funding with the help of former guidance director Janet Cann, soliciting donations, hiring a costume vendor, keeping track of the budget, putting together the scripts and coordinating the numerous production details. English teachers who chose scenes from comedies and tragedies held auditions in September. Some students chosen for roles were experienced actors, but for some it was their first chance to be on stage. After months of rehearsals, the casts and directors, as well as other faculty and student performers, got together for the two nights of performances, which also included a banquet in the cafeteria, as well as a musical performance by the chorus and comedy from festival jesters, Mr. Chad Bigsby and junior Alec Donegan. Also taking part in the Festival were Mr. Jorge Moscoso and Ms. Patrice Rose who acted as Spanish ambassadors to the royal court. Mrs. Trish Fleming was the Festival’s Queen and Mr. John Retchless was the Festival’s King. Mr. Alan Cron was the official trumpet player and Mrs. Sue Patton and the cafeteria staff provided the banquet feast. John Mott acted as the Royal Chamberlain. The witches who introduced each scene included Mrs. Carol Kemenes, Mr. Rich MacAllister and Mrs. Jessica Linehan. Ms. Jen Hartnett played a wench and Mrs. Cheryl Thompson played the part of a gypsy on both nights. Check out the Veritas on-line’s photo galleries from the Shakespeare Festival.